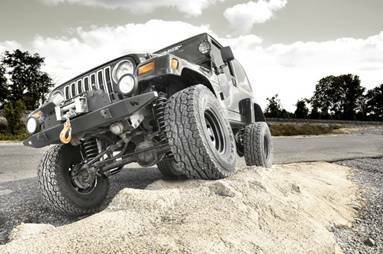 DYERSBURG, TENNESSEE— How do you make our popular Jeep TJ lift kit line even more attractive? 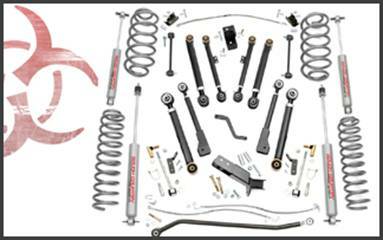 We’ve upgraded our best-selling TJ kits to include our critically acclaimed N2.0 Shocks at no additional charge! Our TJ lift line – including the wildly popular 4″ and 6″ X-Series Kits – now include the power of N2.0. Gain balanced handling both on and off-road with a shock like no other; Designed specifically for the weight and ride height of your Jeep TJ, you’ll see unparalleled performance at no additional cost! N2.0 shocks are nitrogen charged at 200 PSI to prevent foaming and offer a longer lifespan. Incorporating “Velocity Sensitive Valving” technology, these shocks utilize a 10-stage variable valving process that helps facilitate resistance valving incorporated in the shock according to piston rod speed. This allows for a super smooth highway ride and outstanding control in rugged off road situations from the same shock, without turning any knobs or shock removal for re-adjustment. Engineered by Rough Country’s Research and Development Team specifically for both on and off-road use. Each shock is tested and custom tuned for its specific vehicle application. Formed in early 1970’s, Rough Country Suspension® Products was a founder of the off-road industry and is one of the fastest growing manufacturers and marketers of lifted suspension packages and off-road accessories for 2wd and 4wd trucks and SUVs. Rough Country Suspension® Products is owned by Heckethorn Products® which boasts a rich history in the automotive aftermarket, including the invention of the first steering stabilizer for military Jeeps in the 1950s. As a complete supplier, Rough Country Suspension Products offers retailers, wholesalers, and consumers an opportunity to purchase easy to install off-road products the market is demanding.